The dashboard is a place where you can gain an overview over your current productivity situation. The dashboard consists of multiple panels that each show you different information. Which panels are shown depends on which strategies you have turned on. There are a lot of plans to extend the functionality of the Dashboard so you can customize it and get the kind of overview that you need. Stay tuned! To get to the Dashboard click the Dashboard button in the bottom menu (second from the right) or press "D" on your keyboard. 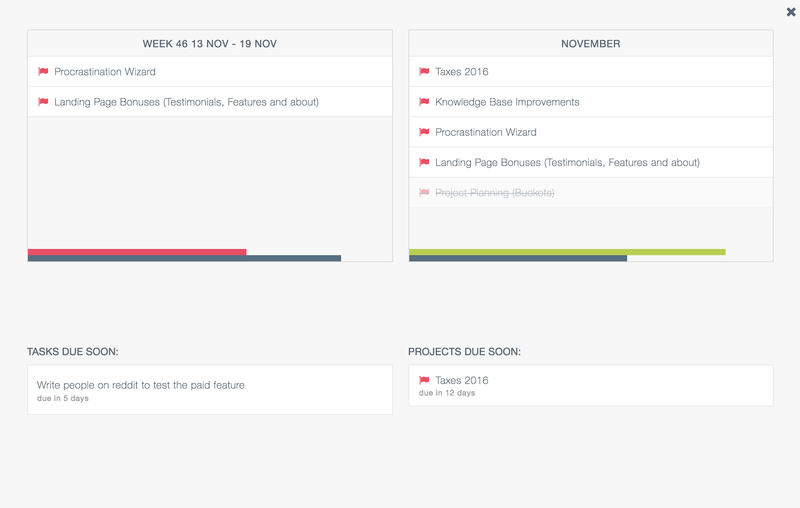 By default there are only two panels enabled: one that shows you tasks that are due soon and another that shows you projects that are due soon. You can schedule tasks directly from these panels. Most of the panels in the dashboard only show up when you have the corresponding strategy enabled. There will be many strategies in future releases that will add panels to the dashboard. For now the only strategy that adds a panel to the dashboard is the "Planning ahead" strategy.